Flexibility is important, so BTX has designed a plug and play system for our ECM 630 system to transition between standard cuvettes and to 25/96-well plates using High Throughput Plate Handlers. The ECM 630 is intended For Research Use Only. Not for use in diagnostic, pre-clinical, or clinical procedures. 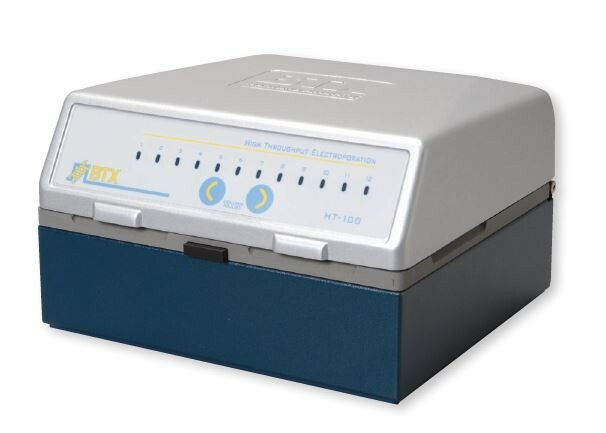 The High Throughput (HT) 96- and 25-well systems offer multi-well electroporation technology for processing multiple samples in seconds. Using the HT multi-well plates instead of traditional cuvettes, the researcher can transition from a single cuvette to either a 96-well or 25-well electroporation plate by using a plate handler. This increases yields and the number of experiment runs in a single day. Experiments take seconds to run, allowing for quick and efficient optimization of the electrical and biological parameters. Once optimized, samples are rapidly processed increasing yields and saving valuable time and money. The key to the HT System is the combination of the ECM 630 Generator with the Plate Handler and multi-well plates. The Plate Handler holds the plates and delivers the pulse(s) to the wells using parameters set in the ECM 630 generator. The HT-100 Plate Handler provides manual track switching (45-0412, 45- 0422). New ECM 630 instruments are also compatible with HT-200 plate handlers for automatic processing of up to 96 samples at a time. Addition of the ENHANCER 3000 allows the researcher to monitor and track key electrical parameters used in electroporation applications. The electrical pulse data is captured as both a graphic display of the wave form and electrical output values following each experiment. The Electroporation Plate Handler creates a safe and reliable working area for processing electroporation plates. They are ideal for use with the ECM 630, ECM 830 and Gemini X2 systems. The HT-100 and HT-200 Plate Handlers have pulse switching technology integrated into the package and gold-plated contacts to mate with a 96-well electroporation plate. The plate handler delivers a single pulse to the wells of the plate, column by column, using parameters set in the generator. The HT-100 uses manual track switching, while the HT-200 employs auto-sense track switching. Both plate handlers work with 96-well plates and come with an adapter to accommodate 25-well plates. WARNING: High Throughput Plate handlers are not for use with ECM 2001+ and ECM 2001 systems.